How will you develop your students’ career aspirations? Enhance your role as a STEM (science, technology, engineering or mathematics) subject teacher by linking curriculum learning to careers. Through weekly tasks, you will identify how to adapt your STEM curriculum, engaging your students in careers linked to their classroom learning. 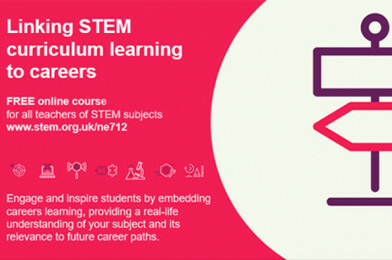 Learn from experienced educators who have adapted their teaching, worked with employers and collaborated with local STEM Ambassadors to create a careers-linked curriculum that both engages and inspires students within the STEM subjects. Click here to sign up – IT’S FREE!